Aren't beauty products fun?? I have a fragrance "gift recommendation" for you guys. It is Pacifica fragrances. Pacifica makes fragrance, candles, body lotion, body wash, soap and body butters. I think it was when I was in 8th or 9th grade , but I used to spend a long time scanning the shelves at Sephora. In the fragrance section I remember the PACIFICA fragrance bottles really drawing my attention. I'm a very visual person, and I always thought these bottles and boxes were so visually enticing! Look BELOW , Aren't they so fun!?? 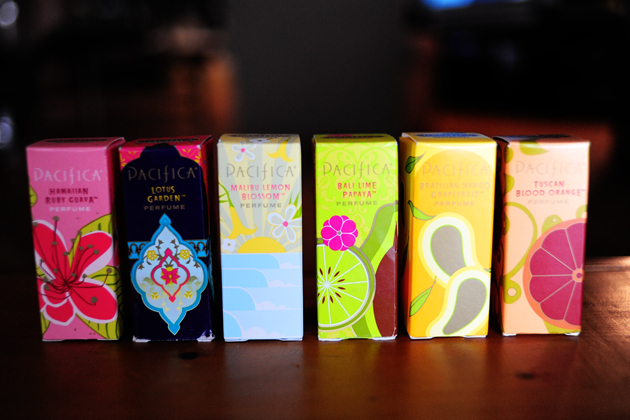 When I first discovered Pacifica, I think my mom got me a fragrance for christmas or something. This was my first one, and I LOVED IT. It's called WAIKIKI PIKAKE. The name means peacock and jasmine, it smells of delicious sandalwood and jasmine. It's probably my favorite scent I have discovered from the line...but I have not smelled all of them! I also first tried this spray perfume, which is what I am most used to. These retail for $22. NOT BAD! Also, I tried the roll on perfume and the solid perfume. The roll on is easier to apply then the solid but they both seem to stay on just as long. If I had to choose between spray, roll on and solid, I would choose the spray perfume. Roll on retails for $12.00 and the solid retails for $9.00. I'm telling you they make a really cute little gift for someone who loves scents. You can find these at Sephora stores, or Whole Food Grocery Stores. :) Pacifica believes in recycling and making all there products from natural and essential oils. Here is the "pacifica manifesto" that is written on their website. I had to share it with you all!! are all in a day's work." these products are 100 % honest as always and I was not paid for this review. shadow picks for dark skin tones.